Detail of carved symbol stone set in wall. 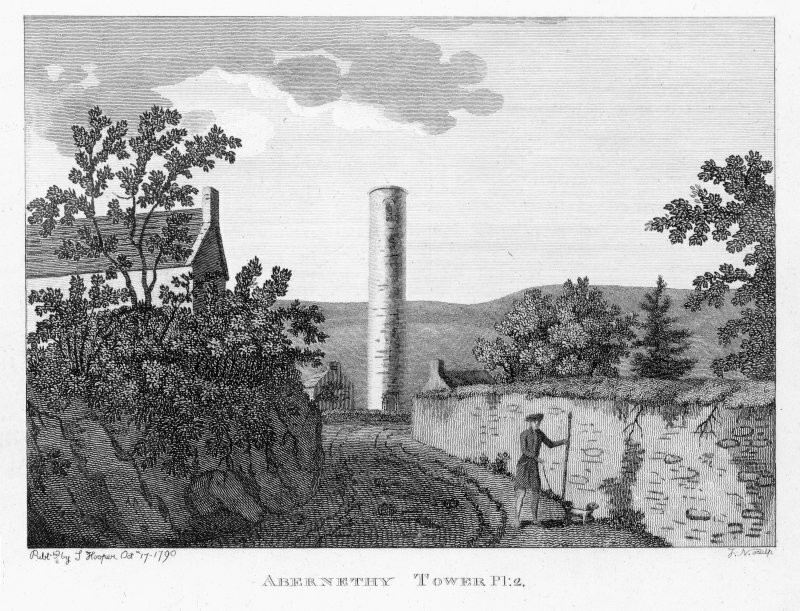 View of Aberneth Round Tower. 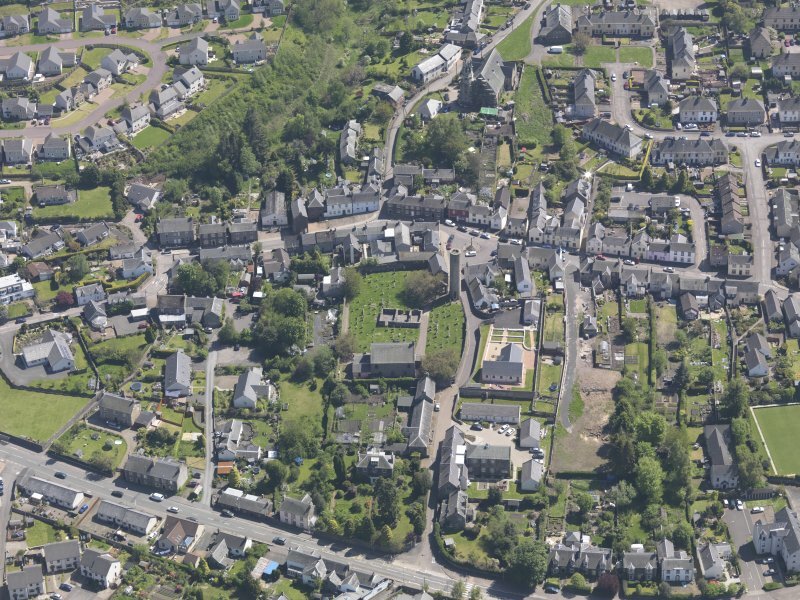 General oblique aerial view of Abernethy centred on the Kirk of St Bride, taken from the NW. 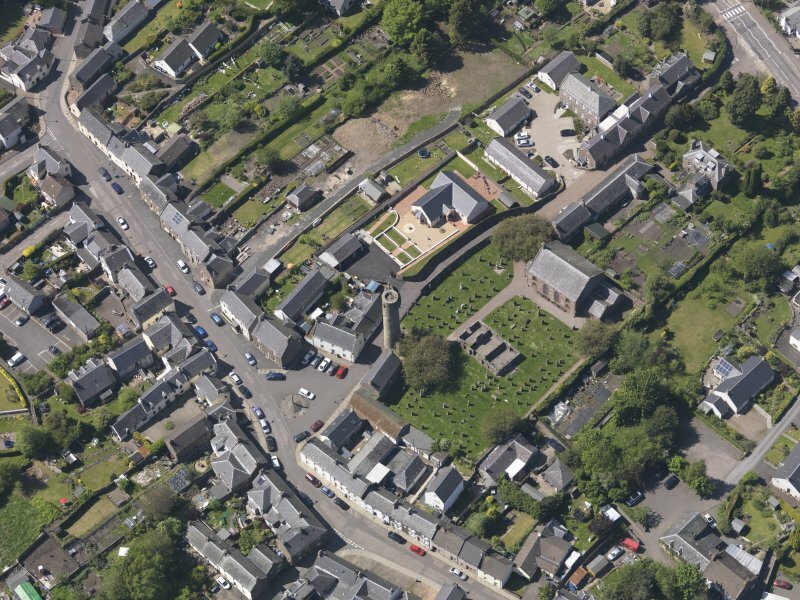 General oblique aerial view of Abernethy centred on the Kirk of St Bride, taken from the SE. 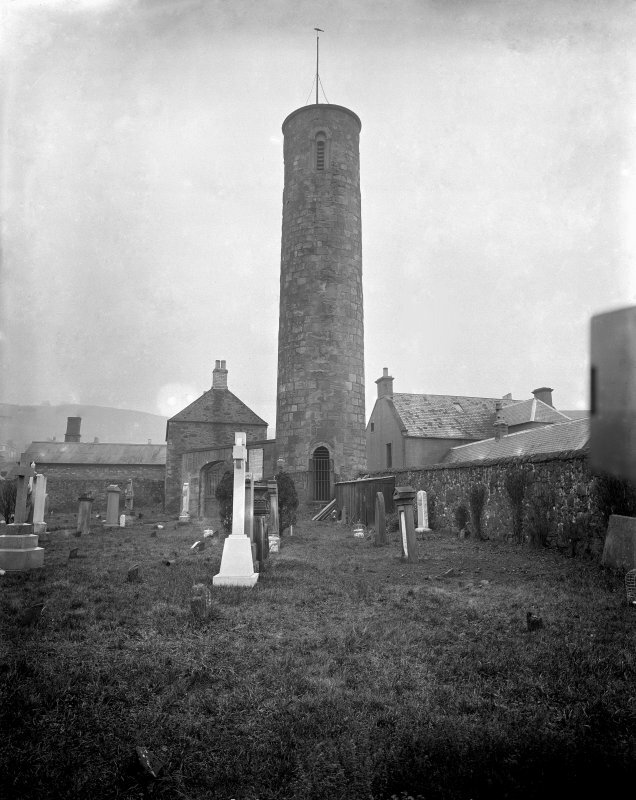 View of base of tower from North-East. 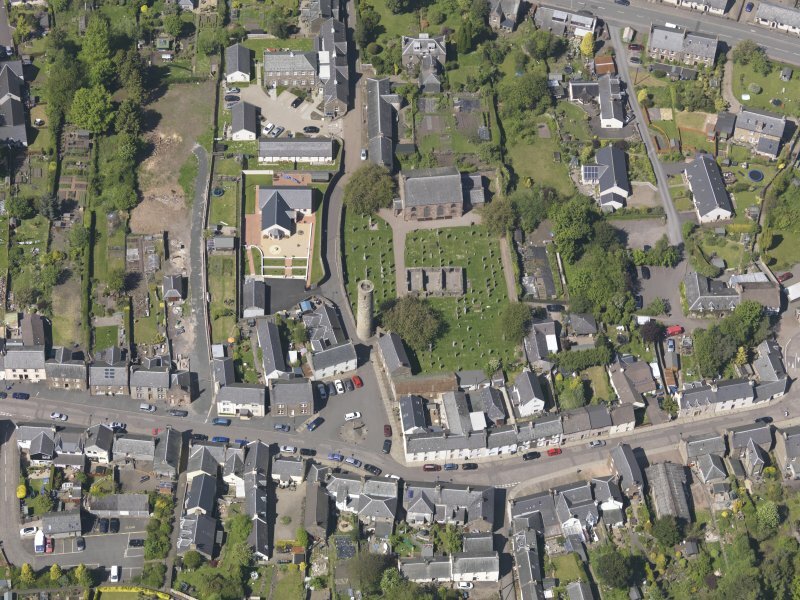 General oblique aerial view of Abernethy centred on the Kirk of St Bride, taken from the WSW. 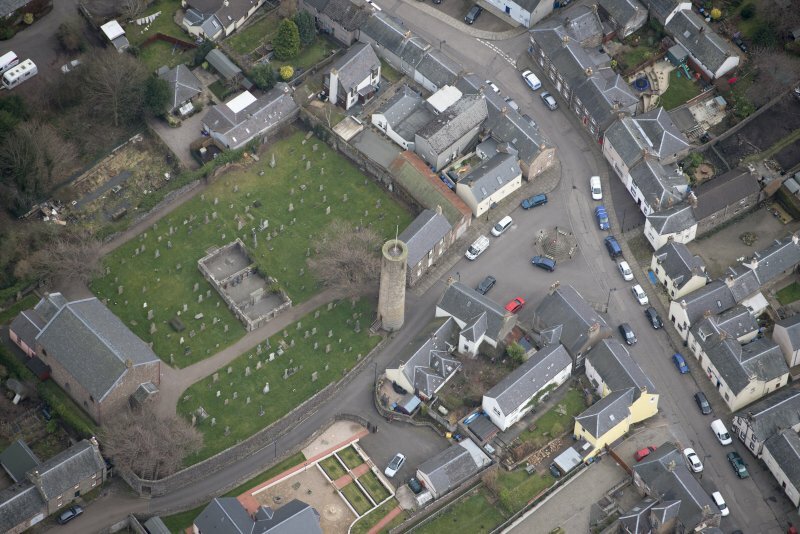 General oblique aerial view of Abernethy centred on the Kirk of St Bride, taken from the E.
General oblique aerial view of Abernethy centred on the Kirk of St Bride, taken from the W.
View of Abernethy round tower. 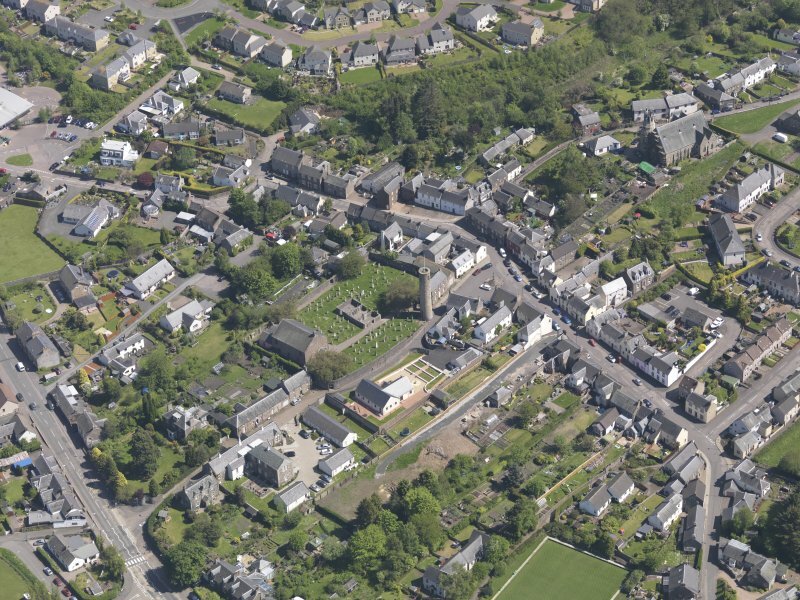 General oblique aerial view of Abernethy centred on the Kirk of St Bride, taken from the SSE. 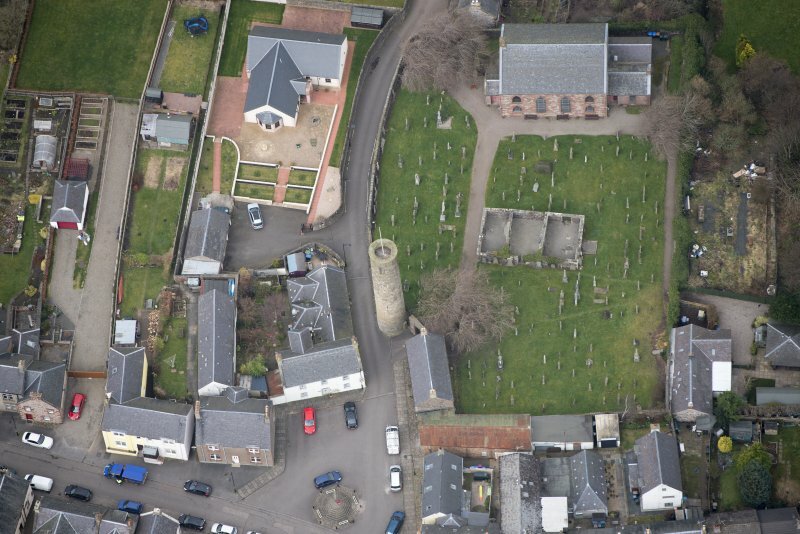 Evidence for discovery: found during grave-digging in churchyard and erected near the church in the later nineteenth century. This is described in ECMS as a rectangular slab incised with an equal-armed outline cross. In referring to Butler 1897, Allen appears to have conflated this slab with Abernethy 7. References: Butler 1897, 237; ECMS pt 3, 341-2. From the photograph in Butler 1897, this appears to be the upper part of a cross-shaft, carved in relief with a plain roll moulding and figural ornament. It is very worn and appears to have been trimmed for re-use as a building stone. One broad face is shown in the photograph. It bears a horse and barely discernible rider, the horse with its head tucked down and a large oval eye. Below the horse’s body is a mesh of legs ending in eight feet, four facing forwards and four backwards (Odin’s horse, Sleipnir?). There are traces of interlace above the horse and figures below its feet but they are too defaced to identify. References: Butler 1897, pl 7; Proudfoot 1997, 51 (no 7). 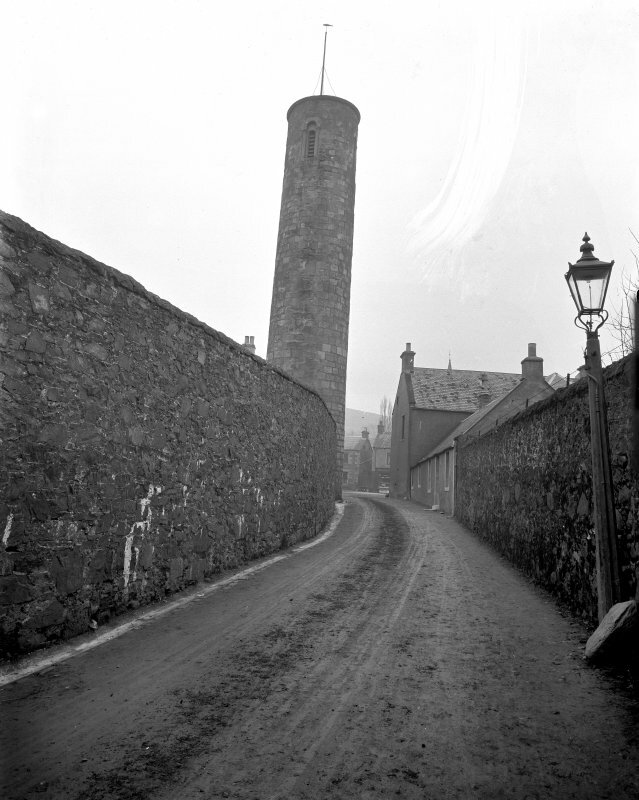 Present location: Abernethy Museum Trust. Evidence for discovery: found in the churchyard prior to 1897. This fragment of a straight-sided cross-slab is carved in relief on both broad faces. Face A displays the upper part of the shaft of a cross with the start of a curve out to the side-arms. 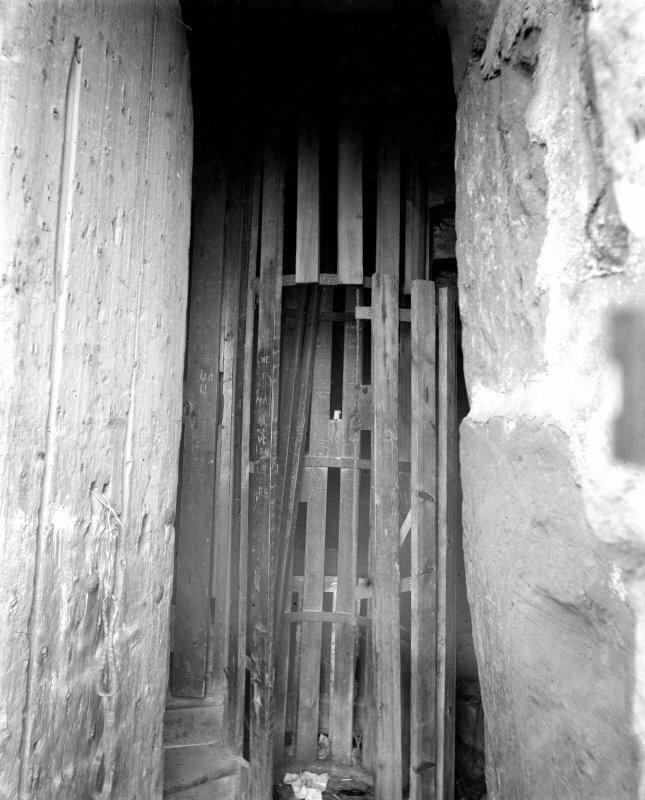 the shaft is plain but is outlined by a roll-moulding. Face B is very damaged but appears to show a panel of ornament of unusual composition. References: Butler 1897, pl III; Proudfoot 1997, 53 (no 9). 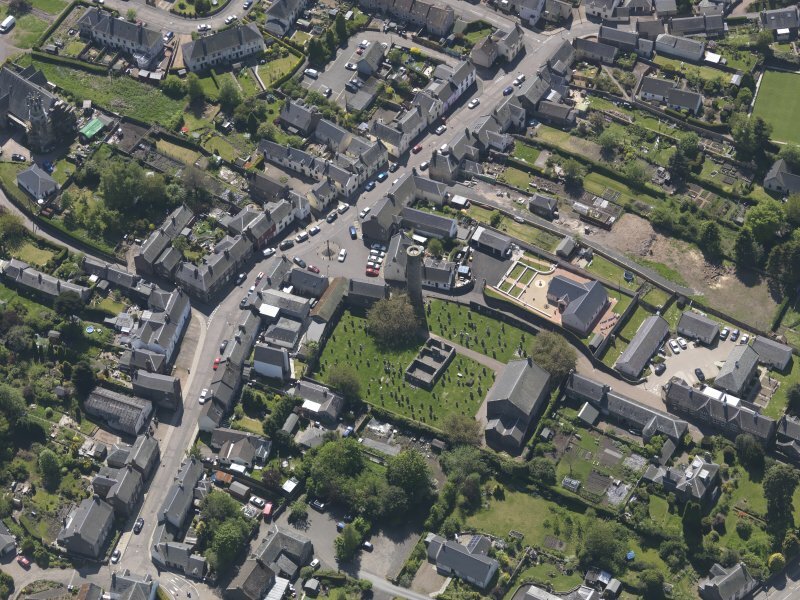 For adjacent Old Parish Church (NO 1902 1640) and present parish church (NO 1899 1644), see NO11NE 2 and NO11NE 111 respectively. For Pictish Symbol Stone ('Abernethy no. 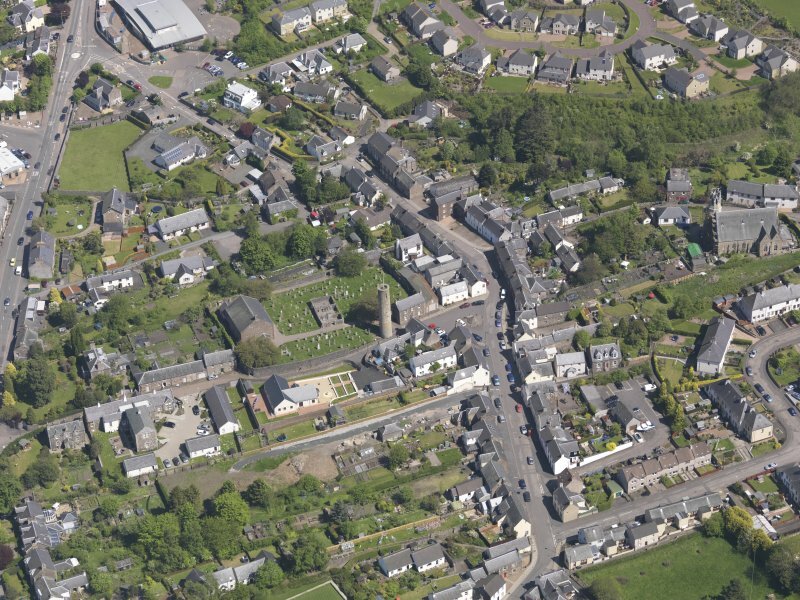 1') at foot of tower, see NO11NE 19. 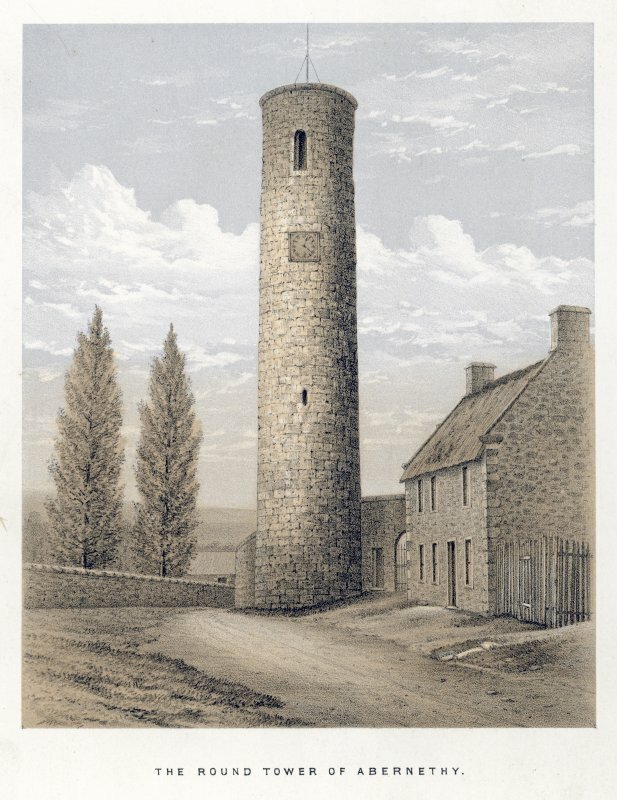 The Round Tower at Abernethy is one of the two remaining in Scotland dating from the end of the 11th century (V G Childe 1961) although earlier authors (A Small 1823 and R R Brash 1862) were of the opinion that it was of an earlier date, the top having been rebuilt as a belfry in the 11th or 12th century, when the door and four upper windows were added. In 1821 excavation inside the base exposed a skeleton and 'fragments of a light green urn, with a row of carving round the bottom of the neck'. Below these were some flagstones, with many more human bones below, including seven skulls, all male. 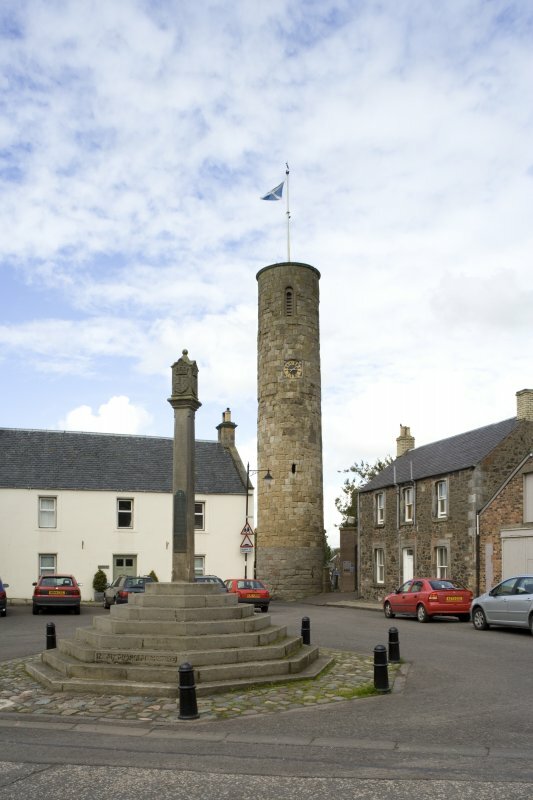 The Tower which is 72ft high has an iron joug or pillory attached to it, and beside it is preserved a Pictish symbol stone. 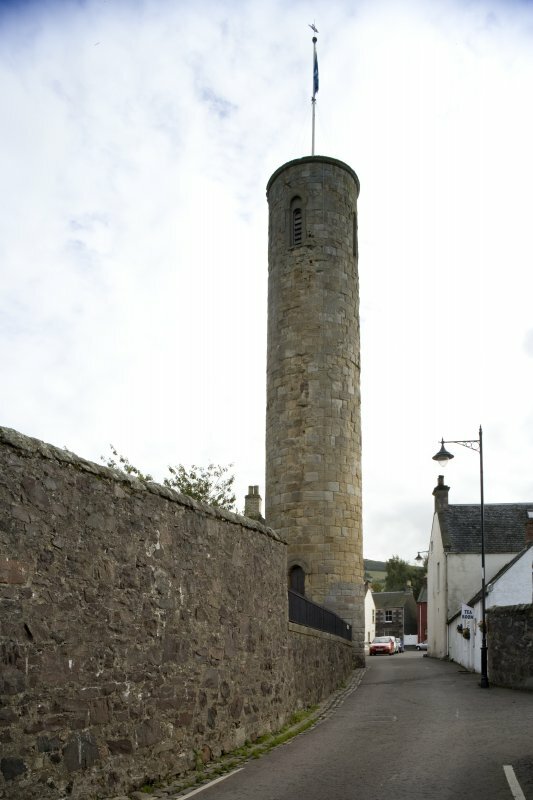 The tower now acts as a belfry to the church. 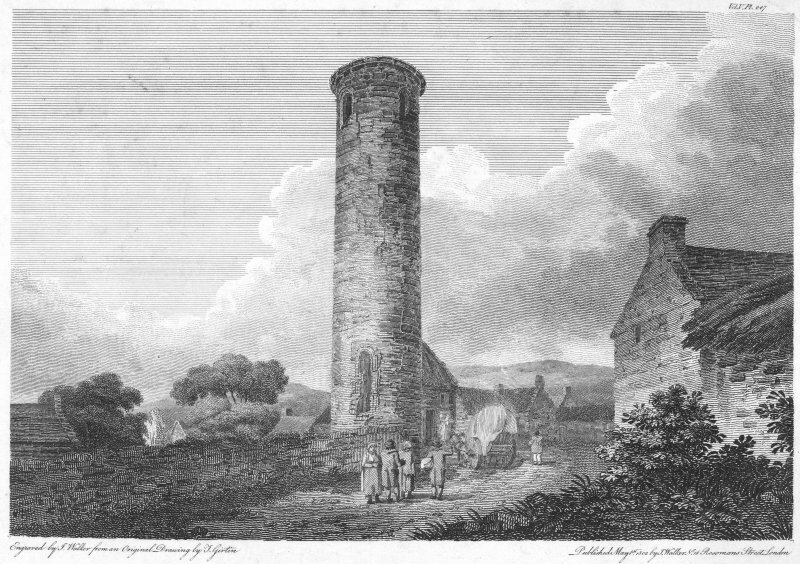 A Small 1823; R R Brash 1862; V G Childe 1961. NO 1899 1638. 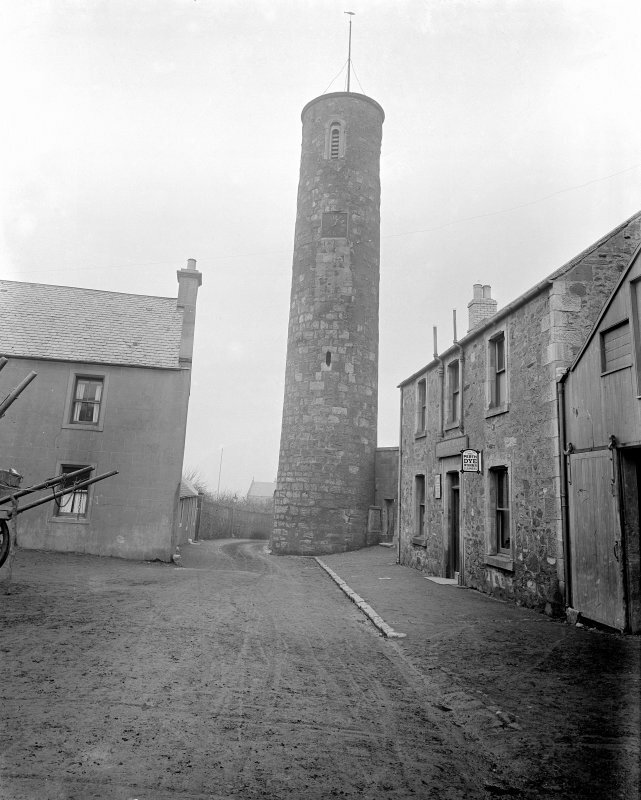 The tower is as previously described. 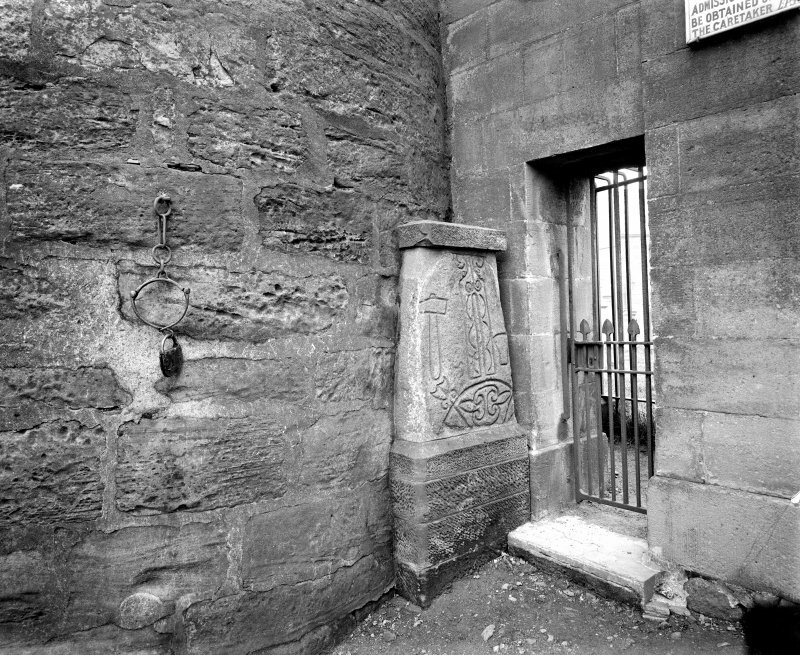 The pictish symbol stone (V G Childe 1961) is the same one as NO11NE 19 which see. 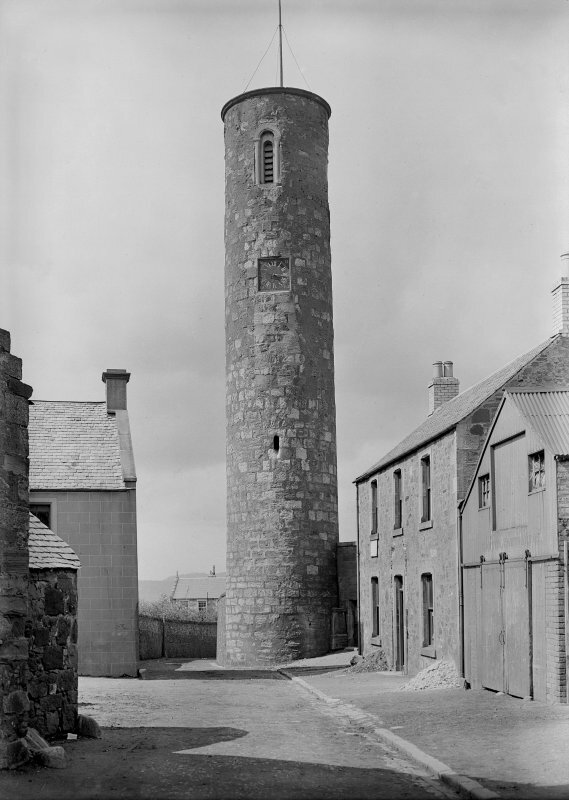 Visited by OS (W D J) 4 August 1965. 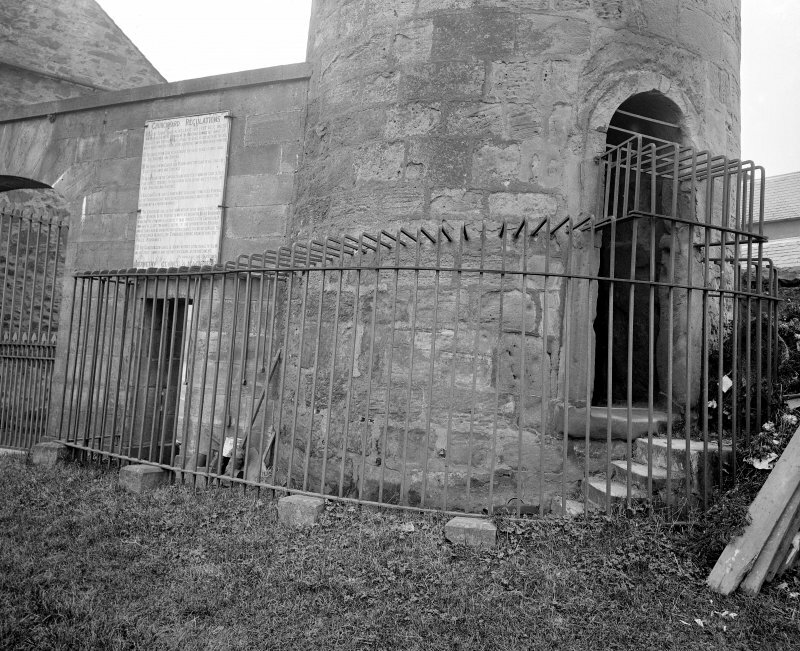 In March 1994, as a result of the cutting of a drainage track by contractors during environmental improvement works, accidental damage was caused to the circular foundation base of the tower. SUAT was commissioned to record the exposed archaeology. 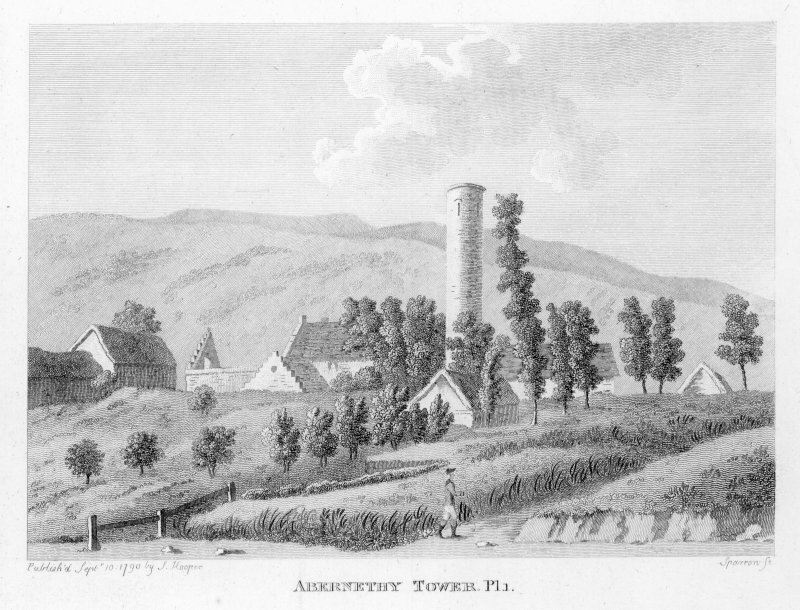 The foundation plinth appeared as a collar, of larger diameter than the tower itself. It comprised a single course of roughly faced, rectangular, pink sandstone blocks with a dark grey clay matrix bonding. Two of the stone blocks had been removed at an earlier date, possibly during the insertion of a service cable. One block was cracked as a result of the ongoing groundwork. The foundation blocks overlay a conglomerate, 0.16m thick, of grey-brown clay, containing small pebbles and stone fragments. 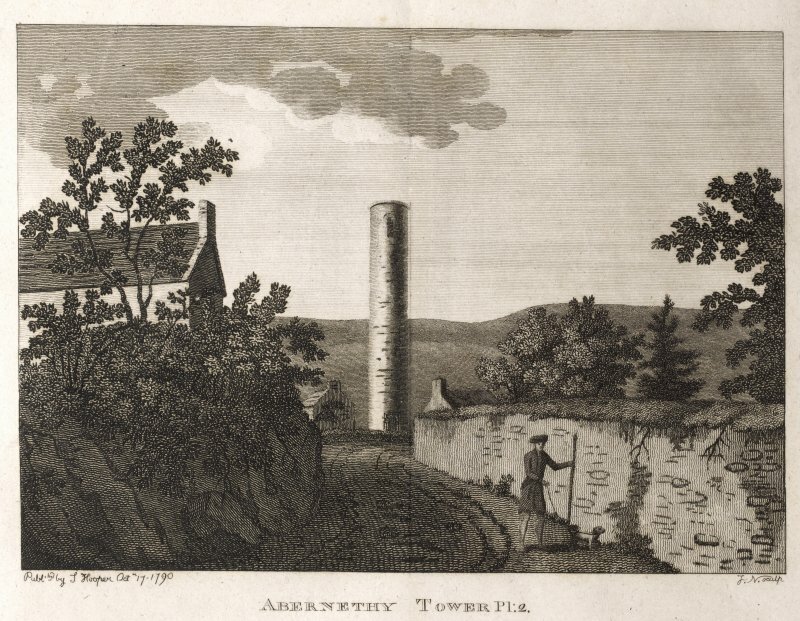 It would appear that the foundation plinth represents the top of a deeper foundation of similar diameter as the tower, and therefore undisturbed by the drainage track. No direct dating evidence was recovered. Sponsor: Tayside Region Roads Department. 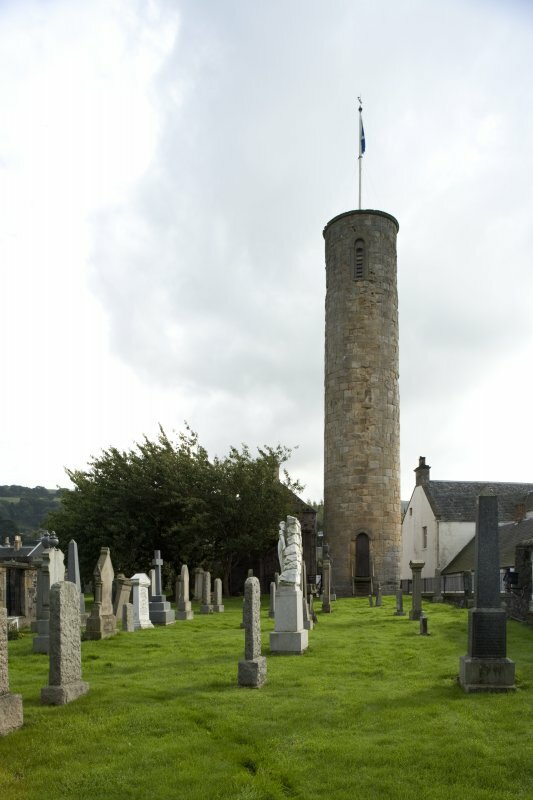 The round tower at Abernethy is in the care of Historic Scotland and remains in good condition; the iron jougs are attached to the external wall. 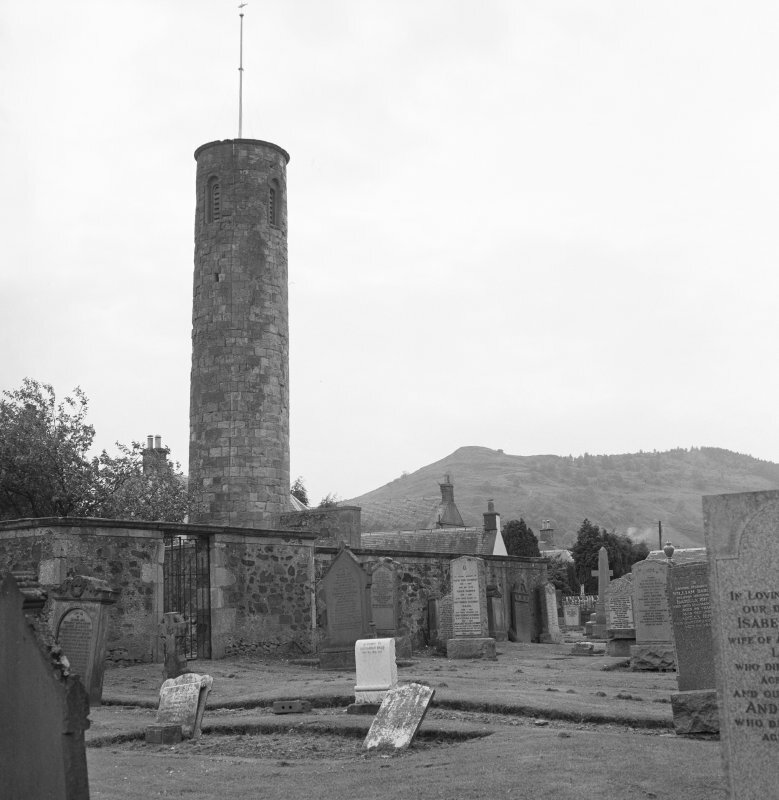 Visited by RCAHMS (JRS), 27 November 1996. 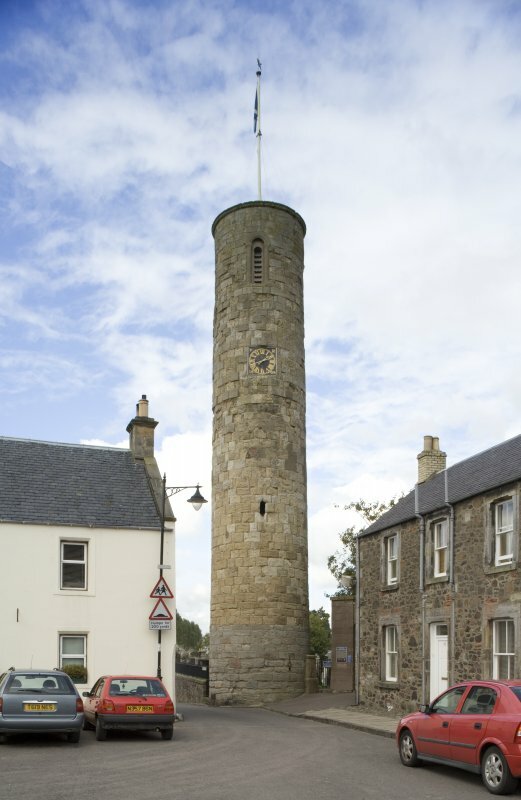 The round tower at Abernethy is probably broadly contemporary with its counterpart at Brechin (no. 66), dating from the 11th century. It stands approximately 22m high, and access to the top, from which there is a superb view, is by means of a modem spiral stair. The internal diameter remains constant at 2.515m but externally the wall battens from 4.648m at the base to 4.267m at the top. 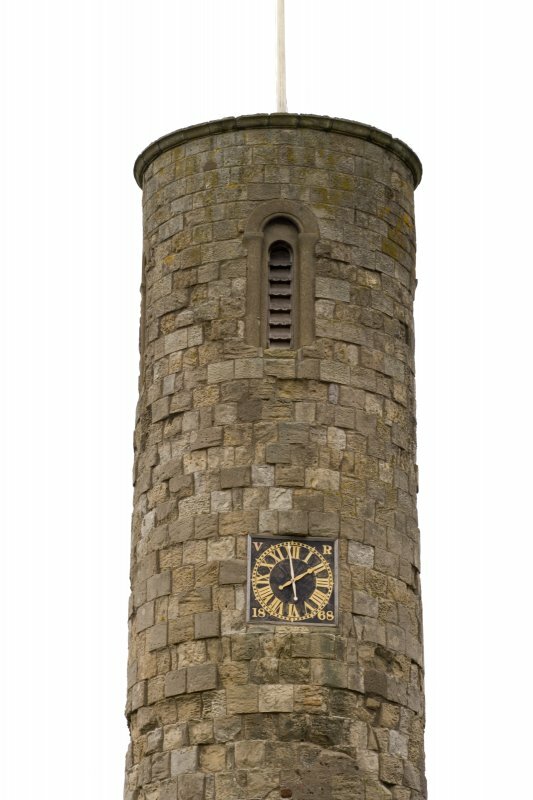 The bottom twelve courses are built in a different stonework to the remainder, but the entrance door is constructed of the same stonework as the upper section of the tower. 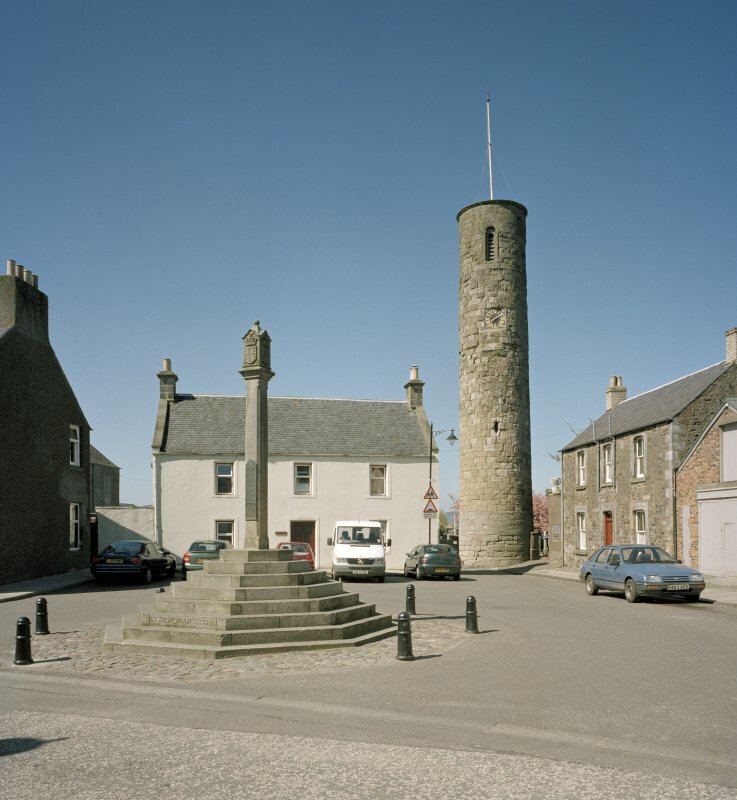 This suggests that there may have been an earlier tower and that on rebuilding it a new doorway was slapped in the existing base. 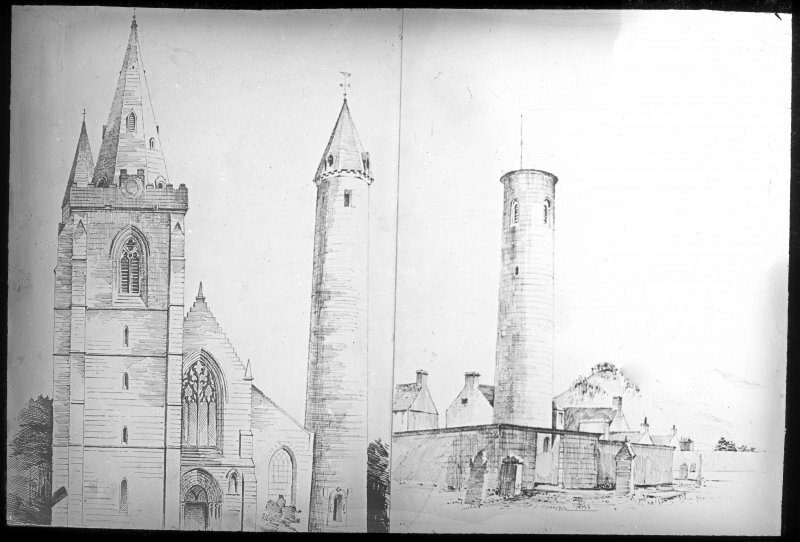 The stone used for the bottom courses is remarkably similar to that used for St Rule's Church, St Andrews (see no. 64), and both may come from the same source, possibly by sea as land transport from a common quarry is highly unlikely at this early date. 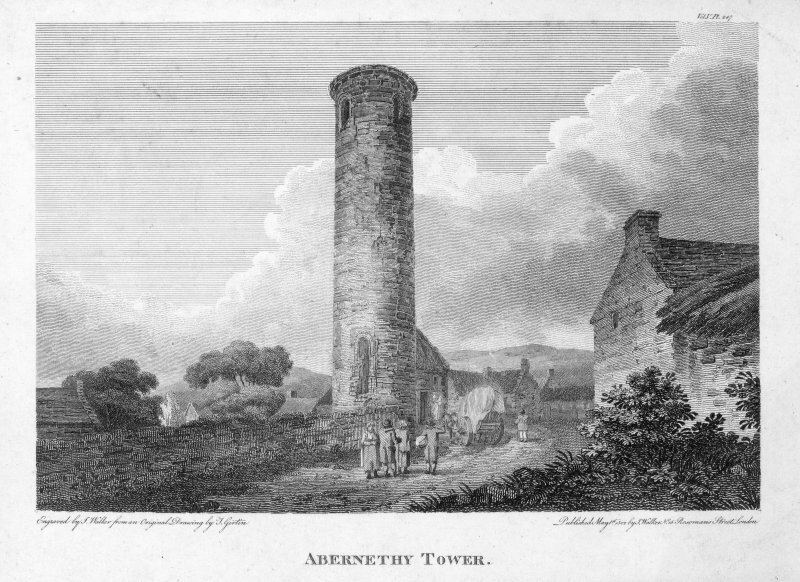 It is probable that Abernethy was a place of some importance throughout the Dark Ages. 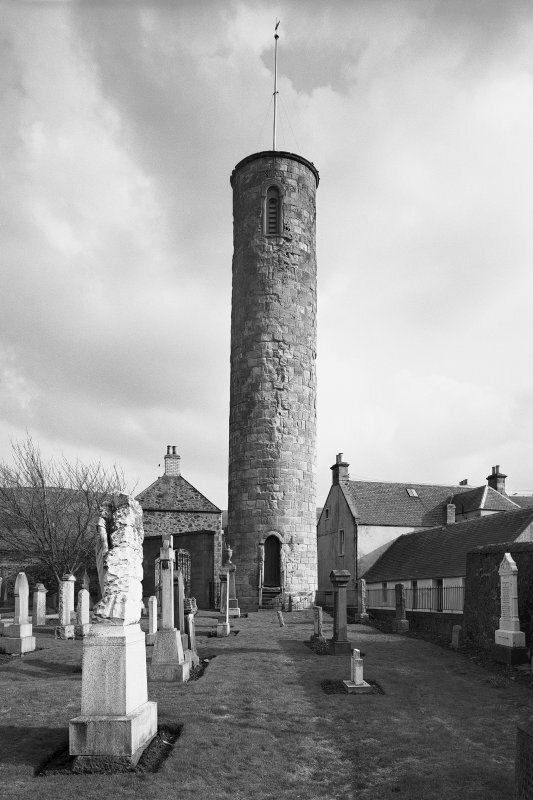 It is mentioned in the margin of one of the surviving copies of the Pictish king-list and some scholars believe that the king-list may have been compiled here in some vanished Pictish monastery, perhaps related to the tower. 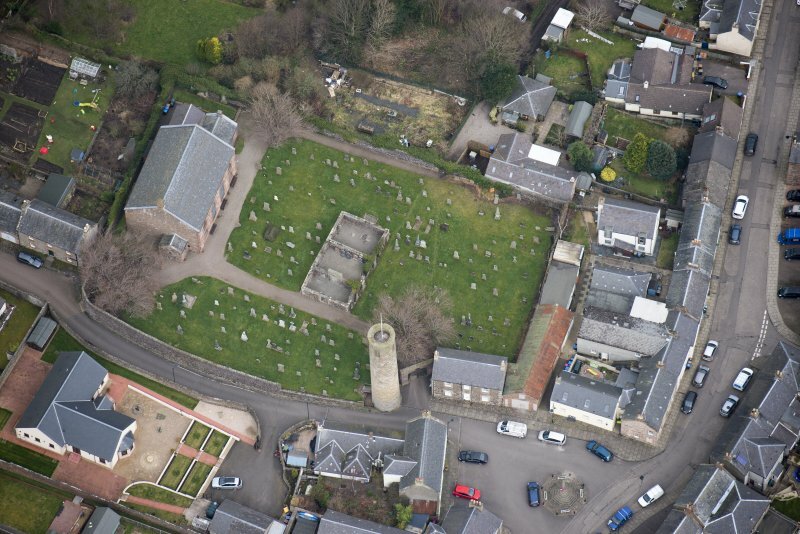 Several early carved stones have been found in the vicinity, including the Pictish symbol stone now set against the wall of the tower, beside the gate into the churchyard. 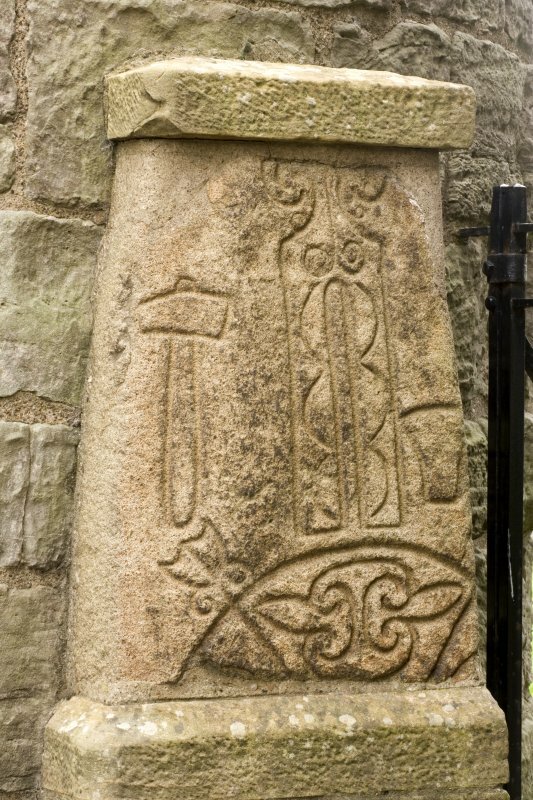 This is a 7th century stone,incomplete but bearing four sharply incised symbols: a 'tuning fork' flanked on either side by a hammer and anvil, and below a crescent and V-rod. Alongside is a metal collar, or jougs, by which offenders were chained as punishment in medieval times. South-west of Abernethy, on a flank of Castle Law, there is a ruinous but still impressive hillfort (NO 182153). Its situation allows a clear view over the Tay and Earn rivers to the north and over Abernethy Glen to the south-east, a minor route-way into the interior of Fife. The fort was defended by a massive stone wall, some 6 m thick, which has collapsed into a broad band of rubble; excavation revealed that the stonework had been stengthened by transverse and longitudinal wooden beams. There is an outer wall at the west end of the fort, and a rock-cut cistern inside the fort on its south side.